Nigeria accounts for more than 25% of the world’s malaria cases and 19% of the world's malaria-related deaths — more than any other country. 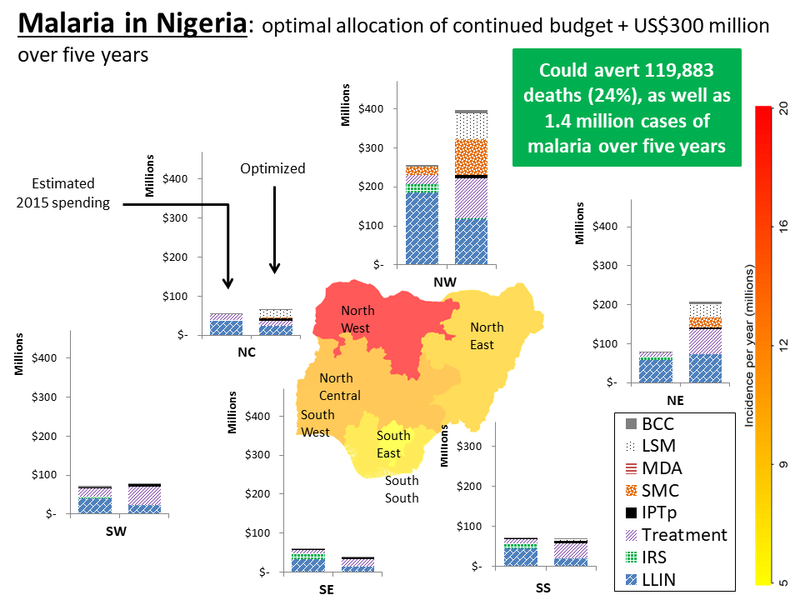 Optimizing continued estimated 2015 spending plus an additional US$300 million investment could avert 119,883 deaths (24%), as well as 1.4 million cases of malaria. Treatment and LLINs are priorities to reduce mortality and incidence respectively. IPTp and BCC are cheap and effective and should be funded. Additional funding should be geographically prioritized to the northern regions. The Optima Malaria model is currently deployed in back-end Python code and can be run by one of our modeling specialists. A front-end version may become available in future.